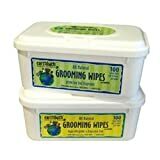 Earthbath Grooming Wipes have become my favorite wipes ever, which really took me by surprise. I’m not one to spend money needlessly. I had been using scent free baby wipes to clean up my dog in between baths and noticed that the wipes would dry out before I had a chance to use even half of them. That waste bothered me. I had a chance to take a closer look at Earthbath products during a pet products show and decided to check them out. I bought the grooming wipes and compared them to the baby wipes. Both are fragrance free, both are hypoallergenic, both have aloe, in different amounts. Ingredient that Earthbath Grooming Wipes have that the baby wipes do not have Vitamin E and Hawaiian Awaphui which conditions the dog’s coat. Earthbath wipes are not sticky or greasy feeling and I’ll tell you what really had me sold on this – besides the fact that it works well in cleaning up my dog. This whole review was prompted by an accident. I had bought my first package of Earthbath Grooming Wipes back in January, figuring it would be great for my dog’s skin in the cold dry weather. And it was! But since I bought the travel pack with 28 wipes per package, Spring arrived and I put them aside. Months later I noticed the packet and thought I’d probably have to throw the remainder out. I pulled back the label seal and pulled one out. The wipe was as moist as the day I first opened the package! Yes, it says that on the back of the package, but I’m conditioned to not believe claims on packaging – wow, was I impressed! I never expected wipes to last 6 months in a package with a resealed label. Earthbath Grooming Wipes state on their packaging that if their wipes dry out you can simply add a little water and they will reconstitute or they will replace the package. Earthbath Grooming Wipes are made in the USA, and are lanolin and alcohol free. 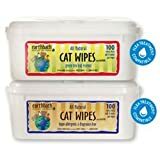 These wipes are for our beloved furry friends who need a good cleansing, but may have sensitive skin, allergies, or who just don’t want to smell like anything but themselves. Mild cleansers freshen and deodorize, while succulent leave-in conditioners impart a healthy shine and leave a supple coat. Your best friend will look and smell better than ever before! Eartbath Hypo-Allergenic Cat Wipes with Awapuhi safely and easily wipe away dander, dirt and residual saliva in your finely furred friend’s coat. Dander & saliva build-up are the leading causes of human/cat allergies, and use of these wipes can help resolve this issue in short order, while leaving your cat or kitten softer, shinier & smelling better than ever before. Mild cleansers deodorize, freshen & clean as the exotic Hawaiian Awapuhi conditions the coat and imparts a healthy shine. Aloe Vera and Vitamin E moisturize both coat and skin. Find more Earthbath Natural Grooming Wipes products on Amazon!